The ramen stall was a simple ruko building and one might easily miss it. But lucky Hakata Ikkousha is located on the main street of Muara Karang, quite convenient I'd say, except for the minimum parking space. Fortunately it was compensated by the plenty of space outside the buildings next to it. I went there alone, so I could get a table rightaway (oh, the convenience of going solo, especially when visiting crowded restaurants!). It almost looked as if the staff outnumbered the patrons, but judging from how popular this place is, I won't wonder at all. I inquired the crew attending to me, she informed me that there are at least 70 staff working here and mind you, it's this way for every single day! Can you imagine how many bowls of ramen being served everyday? The menu at the time being is rather limited, but I saw some soon-available items (such as rice-bowls, etc) that looked rather interesting. Hopefully by my next visit they'll start serving them. So I ordered the specialty here: the Chicken Ramen Special (the other special item was pork). It was rather intimidating watching all the staff shout something (I think in Japanese) in unison, almost like chanting, but it was a rather unique experience that you find nowhere else in Jakarta. The restaurant itself is quite cramped, clearly not somewhere you'd like to hang out at for hours. As my ramen came, I took quick snapshots and took my first taste of this widely-talked about ramen. Upon touching my tongue, I immediately understood what the buzz is all about! The soup/broth is covered in thick layer of oil (not recommended for those on strict diet), non-clear, but tasted oooomph! 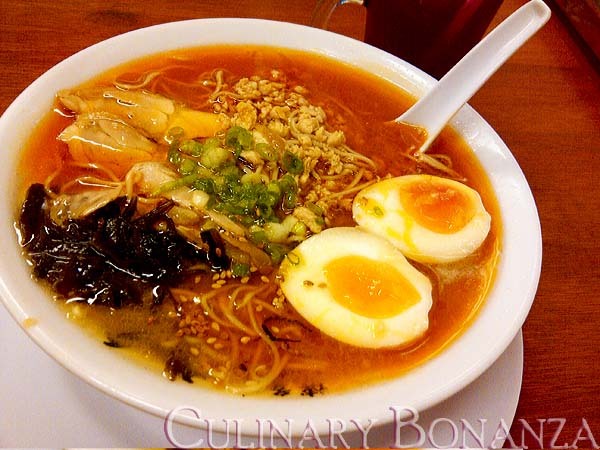 The ramen itself is rather thin, and savoury, cooked to just the right level of springiness. Eat the soup with the ramen together and add the slice of chicken, and you get the perfect combo! *slurp! True, I may not be that experienced in ramen-dining, but I can tell good stuff from the ordinary ones and Hakata Ikkousha clearly distiguishes itself from the rest. So, if you're thinking of having some ramen one of these days, I'd recommend that you head this way before trying anything else.